15Now Minnesota supporters rally outside the Hilton in Minneapolis during DNC meetings. As Hillary Clinton, Bernie Sanders and other presidential hopefuls wooed party leaders in Minneapolis during the Democratic National Committee meetings last weekend, local worker and retiree groups mobilized inside and outside the event, looking to push their concerns to the forefront of the 2016 campaign. 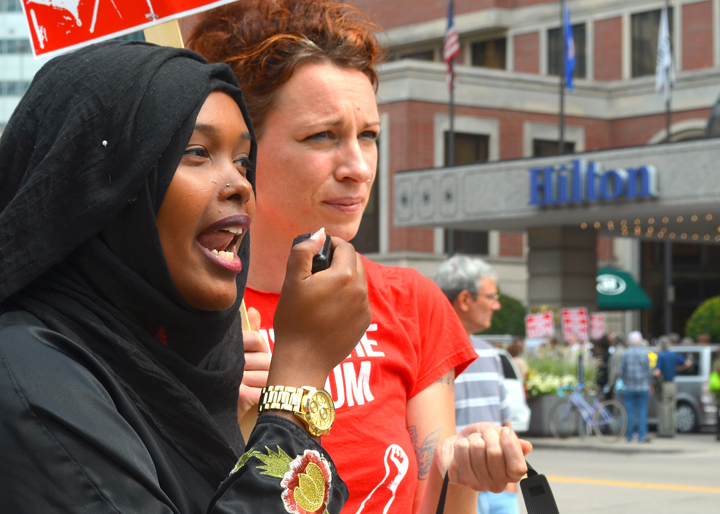 On Friday, activists with 15Now Minnesota rallied for a $15 minimum wage outside the downtown Hilton, where contenders for the Democratic presidential were offering much-publicized speeches. 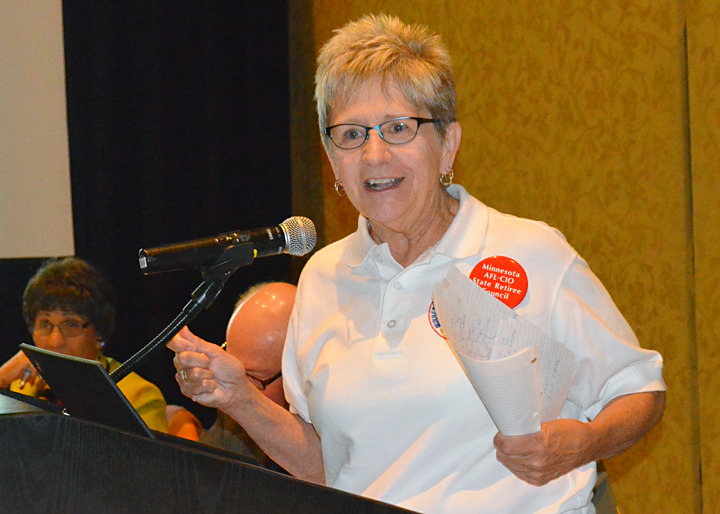 And on Saturday, union retirees and other Minnesota seniors elbowed their way onto the agenda of the DNC Seniors Coordinating Council’s meeting. They urged the party to put forth a bold vision for strengthening Social Security and Medicare, and ensuring economic security for all seniors. Led by the Minnesota State Retiree Council, AFL-CIO, seniors staged a program that featured testimonials, a sing-along with the Twin Cities Labor Chorus and an actor – Barry ZeVan – portraying former President Franklin Delano Roosevelt, ZeVan’s childhood hero. Retired AFSCME member Martha Johnson addresses the DNC’s Senior Coordinating Committee. Johnson, a former president of the retiree council, drew a standing ovation when she called on lawmakers to “scrap” the payroll-tax cap that shields income earned above a designated amount – currently $118,500 – from Social Security deductions. “That would fund full benefits to the middle of the century,” Johnson said, and would represent a “step toward long-term stability” for Social Security. Other speakers warned against efforts to privatize Social Security or reduce benefits, including President Obama’s failed attempt to link annual inflationary increases to the so-called “chained CPI.” It’s estimated a third of U.S. seniors rely on Social Security as their only source of income, and weakening the program would threaten the economic security of millions of other retirees. After the retirees’ program concluded, U.S. Rep. Keith Ellison took the podium and pledged to keep fighting for Social Security, Medicare and income security for seniors. The Minneapolis DFLer urged retirees, in turn, to tune into debates surrounding proposed service cuts at the U.S. Postal Service and the sprawling Trans-Pacific Partnership. The NAFTA-style trade agreement has the potential to impact prescription drug prices, Ellison warned, as pharmaceutical companies look to extend patents on pharmaceuticals and grow their profits. Najma Ahmed speaks in favor of a $15 federal minimum wage. 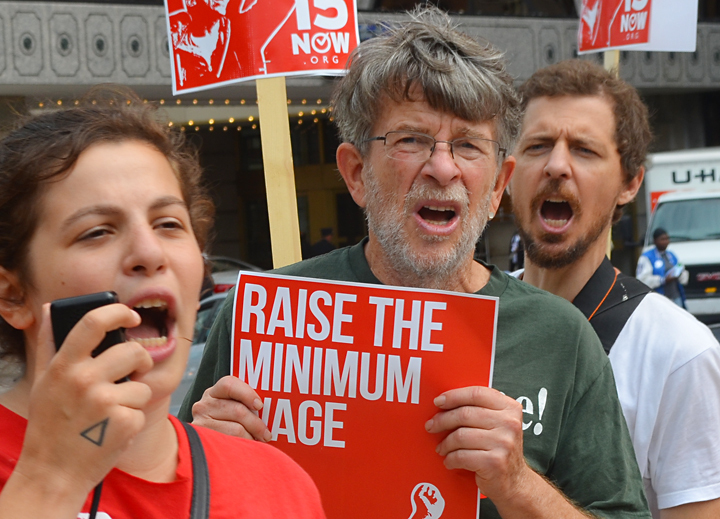 15Now campaigns – alive in Minneapolis, St. Paul and at MSP International Airport – have won minimum-wage hikes in Seattle, Los Angeles, San Francisco and other cities. And two Democratic presidential candidates, Sanders and former Maryland Gov. Martin O’Malley, already support $15 nationwide. If given the opportunity, what would she tell the presidential candidates gathered inside the Hilton?